SMS Chat. Supporting customers who like to text. Ask yourself this: Would you prefer to ask a question using a phone call, email, live chat session or a text message? If you are like most people, you chose text. It is simply the most efficient and most convenient medium to get answers and get things done. Now ask yourself this: How many companies do you know that you can text to ask either the status of an existing order or place a new one? 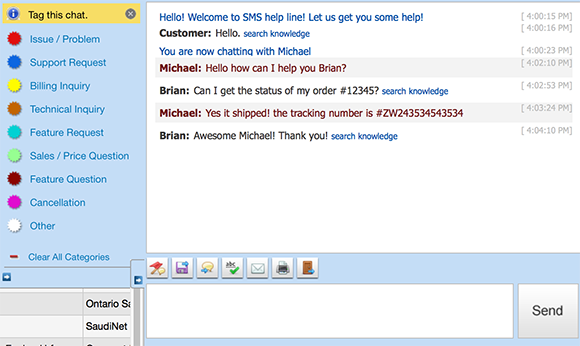 With LiveHelpNow SMS Chat you may now join customer service revolution and offer support via text to your customers. All you need is the phone number you already use to support your customers! Yes you read correctly, we will text-enable your existing landline and we will pipe text messages through to your LiveHelpNow account as live chat sessions! Once a phone number is provided and the ownership is verified, it is provisioned to be able to accept text messages. This process generally takes about an hour. Once we provisioned the phone number, it is immediately able to accept text messages from your customers which arrive as live chat sessions within LiveHelpNow operator console. You may configure automatic pre-chat survey with up to 4 questions to be answered by the customer for the chat request to be validated. 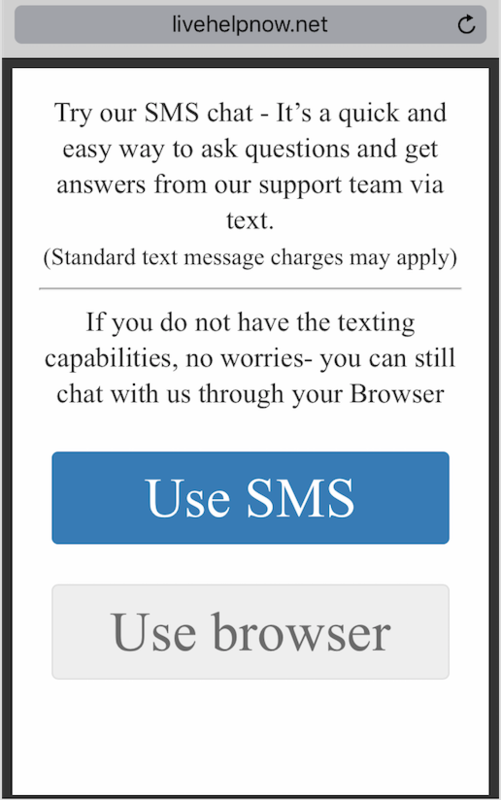 Customers starting live chat on your website using their mobile phones will be prompted to use SMS instead of in-browser chat window. We also encourage to install “Text us” button on your website as well as advertise your ability to accept text messages from your customers in your email campaigns, your website, twitter account and any other company media. We will call you to verify that you own this number and requested to provision it. You will then receive an email from us notifying you that your number is ready for use. b) Offline Greeting- which will be sent after all pre-chat fields have been collected and if there are no operators online under your account. We also encourage you to install “Text us” button code to your web pages for customers to be able to launch SMS chat on your website. You can customize options, and copy code. 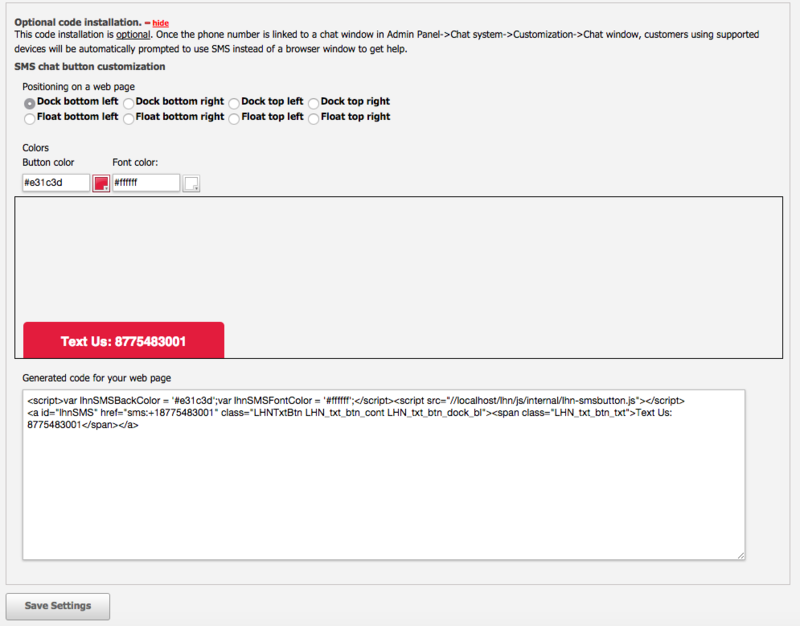 There are a few ways you will be able to tell in your Operator Panel that the chat is coming via text. You will notice under the first column there is a Green chat bubble that represents the SMS. You will also notice that under Browser- it also shows SMS. It’s simple, reliable, convenient and all you need is your current business landline & we take care of the rest! By offering customer service via SMS you will further differentiate your company from competition and make your customers happier at the same time.